The Dallas Paleontological Society (aka Dallas Paleo, DPS was founded in 1984 for “the purpose of promoting interest in and knowledge of the science of paleontology.” Our “Yoda” would be Charles “Chuck” Finsley, d. 2014, who was then Curator of Earth Sciences at the Dallas Museum of Natural History. He gathered like-minded persons to retrieve fossils from the field and prep them for museum display. The resulting mammoth and a turtle from this era are now on display at the new Perot Museum of Nature and Science. As the mammoth project neared completion, talk turned to starting a formal paleontological society. 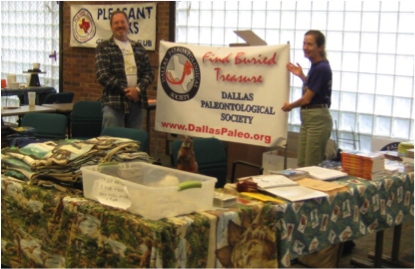 They sought something more than a ‘club’ with its then perceived stigmas, so they formed the Dallas Paleontological Society. The Society’s mammoth skull logo comes from that project. About 100 people attended the initial meeting and now we have over 300 dues paying memberships representing over 650 individuals. When you walk through the Perot Museum’s T. Boone Pickens Life Then and Now Hall you will see a number of references to contributions by individuals of the Dallas Paleontological Society as well as references to the Society itself. Our DPS traditionally meets monthly, on the second Wednesday of each month at 7:30pm at Brookhaven College’s Geotechnical Institute in northwest Dallas, Texas. Our meetings consist of some social time, which includes show and tell of new finds, announcements and then a speaker on some aspect of paleontology. We attempt to make speakers aware of the wide experience, education and age variations within our group and request that they adjust their presentations accordingly. The members of DPS contribute to our community in many ways. Sometimes they respond to a particular request (we need a speaker for a 2nd grade class) while some others initiate projects on their own like providing displays for public entities (libraries, schools, parks, etc.) or volunteering for service at museums, excavations or events. DPS has members who take it upon themselves to make our community more knowledgeable whenever and wherever we can. Perhaps the most popular aspect of our Society is regular collecting or educational field trips. Most of Texas is paleontologically blessed. Our dominant Cretaceous fauna are flanked to the east and south by Cenozoic material with considerable Paleozoic exposures to the north and west. Although most trips are relatively local (with independent arrival at sites or car caravans to multiple sites), we have also participated in tours of institutions like UT Austin’s Vertebrate and Nonvertebrate Labs, the Houston Museum of Nature and Science’s Solenhofen Exhibition, the OU’s Sam Nobel Museum, etc. We have also sponsored chartered bus tours like our most recent ‘Ocean Dallas’ trip that was assembled and guided by a team under SMU’s (chief vertebrate paleontologist) Dr. Louis Jacobs. Twenty field trips a year is not unusual. Occasional out of state field trips are organized and have recently been to Florida and Nebraska. 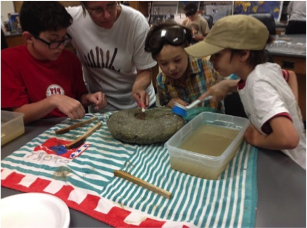 Workshops are held periodically to help educate members on methods for collecting, identifying, cataloging and preparing fossils. Sessions for basic geology and field techniques are also scheduled. 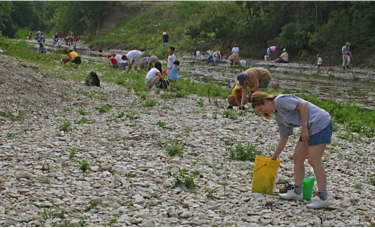 The Society’s Fossil Bureau of Investigation (FBI) is a team of volunteers assigned to investigate fossil finds reported to us by Society members or by the public and to ensure that significant discoveries get linked to the proper institutions. They are also available to excavate or assist local museums, universities and other organizations with excavations. Several mosasaurs, a plesiosaur, mammoths, fossil fish and other fossils have been excavated and donated over the years. A major project ‘Mosie’, a mosasaur that was excavated from a local creek, prepared and was placed on permanent display at the Heard Natural Science Museum in 2014. 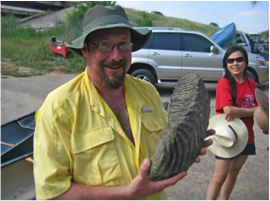 DPS, in an outreach to the public, has hosted the occasional Charles Finsley Lecture Series where specialists on cutting edge advances in paleontology are invited to speak. Most recently in February at an SMU auditorium Dr. Nizar Ibrahim of the University of Chicago spoke on his rediscovery of Spinosaurus, a strange dinosaur larger and badder? than T-Rex. Previous lecturers in this series include: Edwin Colbert, Dale Russell, Peter Dodson, Jack Horner, Keith Thomson, James Martin, Phil Currie, William DiMichele, Mike Everhart, Gary Haynes, and Johan Lindgren. Symposiums with area professionals on the state of North Texas paleontology have also been hosted. As a 501(c)(3) organization we are able to raise sufficient funds through various activities to establish and maintain an endowment/scholarship fund. To date, we have invested over $26,000 in the future of 44 future paleontologists via the Frank Crane Memorial Scholarship Award that is given to graduate students who are nominated by their respective professors and then approved by our Executive Committee. The graduate students are obligated to return to the DPS and make a presentation on their work. 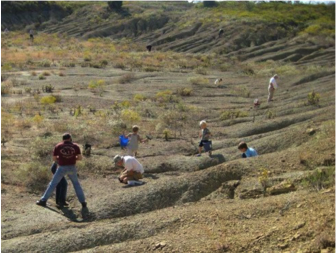 Our Society, in a partnership with the City of Mineral Wells, Texas developed a city-owned fossil park which contains abundant Pennsylvanian age fossils that are available for public collection. The DPS approached the City about the idea, raised approx. $7000 (which the City matched) and helped promote the concept of the park. The grand opening in 2011 was attended by over 400 involved participants. The Chamber of Commerce receives calls from all over the country asking about this trend-setting park. 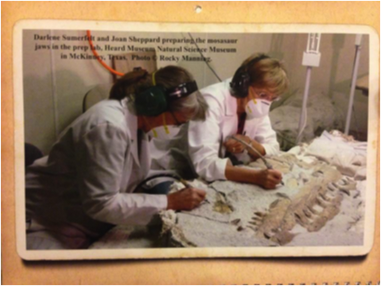 Dallas Paleo Society produces a monthly newsletter, The Fossil Record. It contains items of paleo interest as well as member contributed articles and past and present activities of the Society. The education level of each member is secondary to their focus and dedication to assembling their own personal collections but some have even advanced paleontological boundaries. To date, more than 40 past and present members have made significant enough discoveries that they have been published in various scientific journals. On a secondary level, some members pursue research on their own, independent of formal institutions or guidance. For their efforts, the founding fathers instituted a set of Occasional Papers be periodically issued to contain the results of their work. We just released OP-10. These are edited, but not peer reviewed publications. The Paleo Society has been an ongoing supporter of the Perot Museum of Nature and Science, Southern Methodist University’s Institute of Earth and Man, the Heard Museum, the Arlington Archosaur Site, Mineral Wells Fossil Park, town of Ladonia and other institutions. 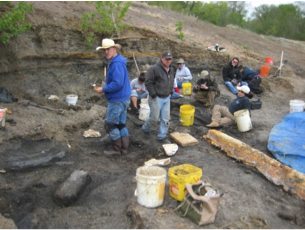 Projects have included assistance with excavations, National Fossil Days, Discovery Days, The International Mosasaur Meeting, funding for lab equipment, GSA Southwest and other projects. We are usually in attendance at local gem and mineral shows, as well as STEM fairs and most recently at several National Fossil Day celebrations organized at multiple locations around this area. As with most organizations, we have a very diverse membership from our PIT Crew to post retirement enthusiasts. Most recently the former education chair recruited area teachers and created the PIT Crew (Paleontologists in Training) which reaches out to family members 7-15 years of age. They organized the curriculum and coordinated the activities, field trips and lessons. They meet at various locations around the DFW area for the convenience of all participants. Some of our high school members have been instructors on occasion. Perceiving the depth of paleo knowledge within the ranks of our Society, member and then UNT professor Dr. George Maxey had a vision to harness these talents. He proposed the assembly of a book on ‘everything paleo’ for amateur paleontologists. It is in the third year of assembly and already contains some history of paleo, how to collect, excavate, prep, photograph and display fossils, how to plan a field outing, significance of micro fossils, dealing with institutions, great finds of DPS members, local stratigraphy, ethics of collecting and suggestions on how to teach paleontology. We hope for publication before the end of 2015. ‘Fossilmania’ is held annually in Glen Rose, Texas, home of Dinosaur Valley State Park. It is a major fundraising event organized by the Society and has dealers, presentations, field trips, fossil swapping and an auction. We have even published two fundraising calendars fashioned after the 2003 movie, 'Calendar Girls'. This year we vastly improved our website, www.dallaspaleo.org with significant help from a new member. The new website will be a huge paleo resource both for our members and for our community. Newcomers seeking information can easily obtain what they need, while the Members’-Only portal provides for direct interaction between members and proprietary Society information. Each member is responsible for updating their own profiles and can even post photos and other Society-relevant information. We basically offer family, single and newsletter-only memberships and invite all who are interested in digging deeper into earth’s past to come join us. Please Visit our website www.dallaspaleo.org for more information.